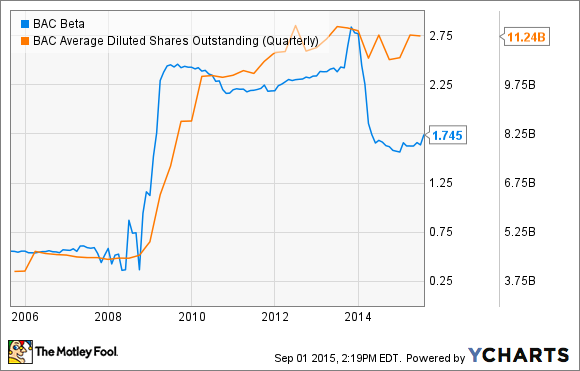 Why Are Bank of America's Shares Almost Twice as Volatile as a Typical Stock? With a beta of 1.71, Bank of America's shares are 71% more volatile than the broader market. When the stock market goes wild, shares of Bank of America (NYSE:BAC) go downright crazy. Yesterday, the S&P 500 was down 2.3% roughly halfway through the trading session while shares of Bank of America had fallen by more than 4.2%. Why is this? This relationship is captured by Bank of America's "beta," a common measure of volatility that compares how much a single company's shares move on a daily basis relative to the broader market. A beta greater than 1 means that a company's shares are more volatile than the broader market, while a beta less than 1 means the opposite. Bank of America's beta is 1.71, meaning that its shares are roughly 71% more volatile than the market at large. If the S&P goes down by 1% on any given day, Bank of America's shares will typically go down by 1.71%. The same is true on the upside. To put that into context, despite the stability that seemingly should come from being the second-largest bank in the United States, Bank of America is in the top 12% of the most volatile stocks on the S&P 500, according to data from Finviz.com. While it's impossible to say precisely why this is, we know three things. The first is that Bank of America's shares haven't always been this volatile. They only became so after the bank more than doubled its outstanding share count in 2009 to raise capital. Its share price plummeted in response, falling from more than $50 in 2007 down to $5 four years later. As such, its shares became more attractive to traders, who could buy and sell a larger number of shares at a price of $5 than they could at $50. BAC Beta data by YCharts. The second thing we know, and this is related to the first, is that Bank of America's shares are the most heavily traded on the S&P 500. An average of 93 million shares of the bank trade hands on a typical day. That compares to 69 million for runner-up Apple. Finally, when you combine the drop in its share price and the associated attraction of traders, it seems only natural that Bank of America's shares would be volatile given the gauntlet of issues it's run through since the financial crisis. Regulators have clamped down on it. Government agencies have sanctioned it for past misdeeds. And private investors have extracted tens of billions of dollars' worth of legal claims from the bank as an indirect result of its 2008 acquisition of Countrywide Financial. When it comes to Bank of America's shares, in turn, the last few years have been a perfect storm of volatility. This won't continue forever, but there's little evidence that it will let up anytime soon.